Where is my doorbell Transformer? We teach you the best places to look for your doorbell transformer. if your looking to find your doorbell transformer your most likely looking to either upgrade your existing doorbell to a smart doorbell like the Ring Smart Doorbell or Nest Doorbell or you want to fix your existing doorbell. You’re in the right place because we’ve worked with smart home pros that have installed hundreds of smart doorbells and found doorbell transformers in just about every location. We’ve complied the list of the most common locations where doorbell transformers are typically found. Related Post: What transformer should you use for Nest Hello? Related Post: What transformer should you use for Ring Doorbells? What Does A Doorbell Transformer Look Like? The majority of doorbell transformers are hardwired and look like the doorbell transformer below. They take standard high voltage in your house at 110V-120V and convert it to lower voltage 16-24V which works with most smart doorbells. Sometimes plug in transformers like this plug in transformer are used for powering a doorbell so keep your eyes peeled for plug in transformers when you are looking for your doorbell transformer. Doorbell transformers are most commonly located near your electrical panel or directly on your electrical panel. Typically when builders are building a new home it’s easiest to locate the doorbell transformer near the main electrical panel because it allows for easy access and replacement if the doorbell transformer wears out. This is the best location for a doorbell transformer and often the most obvious. Unfortunately not all doorbell transformers are located near the electrical panel but it’s a good place to start looking for your doorbell transformer. We’ve seen doorbell transformers located in garages because they allow easy access and are often visible to the naked eye. Typically doorbell transformers are surface mounted so that they don’t overheat. If your looking for your doorbell transformer it’s a good idea to check your garage and make sure that you don’t have anything on the walls that might be blocking you from finding it. In garages we’ve commonly found them near the garage door power outlets which are typically on the ceiling, near electrical panels in the garage, near outlets in the garage or near where cable TV, communications cables or security system wiring might be found in your garage. While looking for your doorbell transformer in your garage make sure to look near any outlets you have in your garage, typically a doorbell transformer is wired near by an outlet or inline with an existing outlet box somewhere else in your garage. My doorbell transformer was tucked away in an HVAC system closet, and I had to replace my doorbell transformer to install my new smart doorbell. It doesn’t seem like an obvious spot at first but there are a lot of homes that have their doorbell transformers located near their HVAC systems. So take a good long long near your furnace for your doorbell transformer. The reason doorbell transformers get placed near HVAC systems is that often times HVAC systems are located in closets where no one will notice wiring and a doorbell transformer surface mounted on a junction box. Locating a doorbell transformer near your HVAC system keeps them out of sight and most likely offers multiple locations where the doorbell transformer could be surface mounted on an existing junction box used for your furnace or HVAC system. Your doorbell transformer might be hidden on the bottom side of the junction box or outlet in your HVAC system closet or it might be mounted on the ceiling in your HVAC system closet. My doorbell transformer was located on the ceiling in my HVAC closet and I’ve also seen them tucked away above the doorways in HVAC closets where you wouldn’t normally look. So take your time looking for your doorbell transformer near your HVAC system or in your utility room. Doorbell Transformer located near HVAC in utility room connected to doorbell. Oftentimes doorbell transformers are located near security system wiring. They can either be located near the security system keypad but more often the doorbell transformers are located near the control station of “Brains” of the security system which can sometimes be located in your garage, in a closet, your basement or a utility room. There are some security systems that even have the doorbell transformer tied directly into the security system. If you have an intercom style system and are looking to replace it with a new smart doorbell like the Nest Hello or Ring Doorbell you will often find that the intercom system is tied into your security system or telephone lines near your security system. You can use this existing wiring to convert your intercom into a smart doorbell with the Ring Doorbell or Nest Hello Smart Doorbell. When looking for your doorbell transformer near your security system it’s a good idea to look inside any wall boxes that might contain security system components to see if your doorbell transformer is located inside. We’ve also seen doorbell transformers located near the phone and cable TV line connections inside your house. In some homes the phone lines and cable TV or internet lines all come into the house at a central location in an AV closet, in the basement or near your main electrical panel. Doorbell transformers often get placed near Telephone and Cable TV lines because they are low voltage wiring just like telephone lines all of the low voltage wiring can get grouped together in one location. If your home is wired with CAT 6 or Ethernet cable throughout your home it’s a good idea to check the main location where all of your low voltage wiring converges which is usually where your Telephone lines or Cable TV lines come into your house. If you have an existing intercom system that uses a phone line your doorbell transformer is most likely near where the phone lines come into your house. Your doorbell transformer might be located in your attic. We typically only find doorbell transformers in the attic in ranches or in homes that have at an attached garage with an attic above that is located near the front door. In multi story homes it would be rare to find a doorbell transformer in the attic because it would require a lot of extra wiring vs running the wiring though a basement, or in the walls. Doorbell transformers are powered by high voltage connection and are typically found near other electrical wiring in the attic so look for your existing junction boxes were a doorbell transformer might have been located. If you have a built in intercom system, built in sound system or built in speakers it’s possible that your doorbell transformer is located either where all of the wiring for your intercom/built in speaker system converges or behind the main unit for your built in sound/intercom system. We’ve seen several instances where the doorbell transformer was located behind the existing built in main control system for an intercom system. We’ve seen this is the built in sound/intercom systems that have radios and CD players built in that were popular through the 1990’s and early 2000’s. Doorbell transformers can also be located in inside low voltage sound system and media system cabinets. So make sure to open these up and check inside. Typically when a doorbell transformer is located inside a media or sound system cabinet they are plug in style transformers and not the typical hardwired transformers used for doorbells. Related Post: Can I use a plug in transformer for the Nest Hello? Related Post: Can I use a plug in doorbell transformer for the Ring Doorbell? What transformer should I use for my doorbell? If you are planning on using a smart doorbell you should get at least a 16V-30VA transformer to power your smart doorbell like a Ring or Nest Hello Doorbell. We have complete guides on what transformer you should use for each doorbell in the posts below but if you want to skip ahead you can this 16V -30VA doorbell transformer is one we have tested and know has enough power for the majority of smart doorbells. Even if you’re not planning on adding a smart doorbell now it’s always a good idea to use a transformer powerful enough that a future smart doorbell would be compatible. In some homes the wiring runs are extermely long and you might need to use a higher voltage 24V transformer to power your smart doorbell. If you doorbell wiring is more than 80-100FT from the transformer to the doorbell it’s not a bad idea to use a 24V transformer that will provide more power to the doorbell. How do I test my Doorbell Transformer Voltage? If you want to find your doorbell transformer voltage you can do so by looking on the side of the transformer. Typically the output voltage and ratings are stamped right on the transformer. The stampings can be small so make sure you get close or use a good flashlight to illuminate the doorbell transformer so you can read the markings on the transformer. Example of Doorbell Transformer Rating: This Doorbell Transformer is 16V-10VA it might work with your smart doorbell but we typically recommend using a transformer that is rated at least 16V-30VA like this doorbell transformer. The markings on the transformer should tell you how much voltage the transformer is capable of putting out but overtime the transformers can become damaged and provide less voltage or the wiring to the doorbell can be damaged and not put out enough voltage to power a smart doorbell. In this case it might be necessary to take a reading of the doorbell transformer voltage right at the doorbell wiring itself. To do this you need a multimeter to measure the voltage, there are variety of inexpensive multi-meters available on Amazon but we recommend this multimeter by Etekcity because it’s easy to use with it’s auto ranging function so you don’t need to know much about how to use an multi meter to get this to work. Literally you turn it on, turn the dial to the V ~ with a squiggly line and you can read the voltage. Other multimeters require you to know how a multimeter works and pick the correct range to get an accurate reading. The Etekcity Auto Ranging Multimeter is about a simple as it gets and is easy to use. Having a multimeter around the house is a good tool to use to test if you’ve turned off the power before doing remodeling work, troubleshooting electronics or checking your car battery voltage. Multimeter for testing doorbell transformer voltage. To check your doorbell transformer voltage you want to check it at the doorbell itself to see how much power the doorbell is receiving. You can do this by turning the multi meter on, setting it to the V~ voltage reading symbol for AC voltage and placing your probes across the two screws or terminals on the back of the doorbell voltage. If your getting a low reading it’s probably good to also test the terminals at the transformer itself and see what reading you are getting there and if there is any voltage drop. What if I can’t find my transformer or I don’t have any existing wiring for a doorbell? If you don’t have any wiring for a doorbell or a doorbell transformer you could wire up a new doorbell and transformer or you could get a wireless battery powered doorbell from Ring. 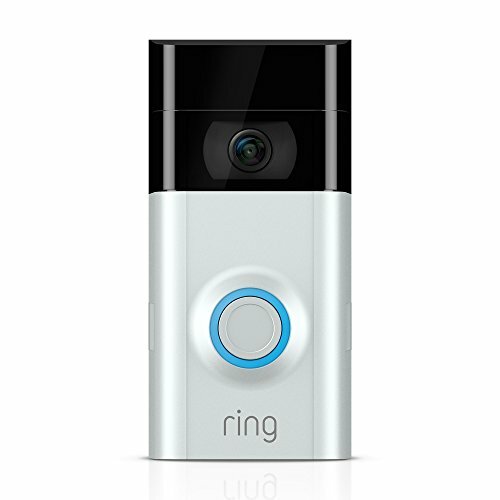 Ring offers 3 different doorbells that don’t require any wiring and are 100% battery powered. The Ring Doorbell, Ring 2 Doorbell and the Ring Door View Cam are all battery powered. If you end up choosing to use a battery powered smart doorbell like the Ring 2 Doorbell it’s a good idea to make sure you get an extra set of rechargeable batteries so you can swap them out while re-charging your doorbell batteries. It’s also important to have a strong wifi network connection for your battery powered doorbell so that the batteries will last a long time and you get a good connection to the smart doorbell. If you have a weak wifi connection to your smart doorbell it can reduce the battery life and require you to charge your smart doorbell more often. Using a mesh wifi system like a Google Wifi or Eero Wifi System to create a strong wifi signal near your smart doorbell placement it typically the best option to ensure you have a strong wifi signal near your doorbell. I personally have the Eero system installed in my home and it immediately increased my wifi network speed by almost 3 fold when I installed it. I’ve tested the Google Mesh Wifi and it’s also a good option for mesh network but I personally like Eero a little better than the Google Mesh Wifi because the Eero range extender beacons have a cleaner look and plug directly into a wall outlet and don’t require separate mounting bracket like the Google wifi routers. Does Ring Doorbell Work With Alexa? What doorbell transformer should I use for Nest Hello? What doorbell transformer should I use for Ring?